Dogs Can Be So Unpredictable, Can't They? Our dog Pluto is always getting injured when we're off campaing or away on holiday. It's almost as if she loves meeting those white-coated vets whereever we go. 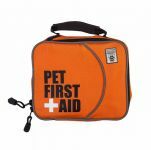 Luckily for us, we always have a Dog First Aid Kit at hand. A little guidance from the manual, some wrapping and tape and we are good to go. 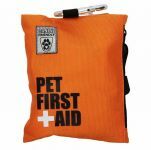 Whether you keep a full kit in the car, or a pocket kit on the leash, you'll always be prepared!